Alarm clocks for the deaf and hard of hearing featured in new brochure. 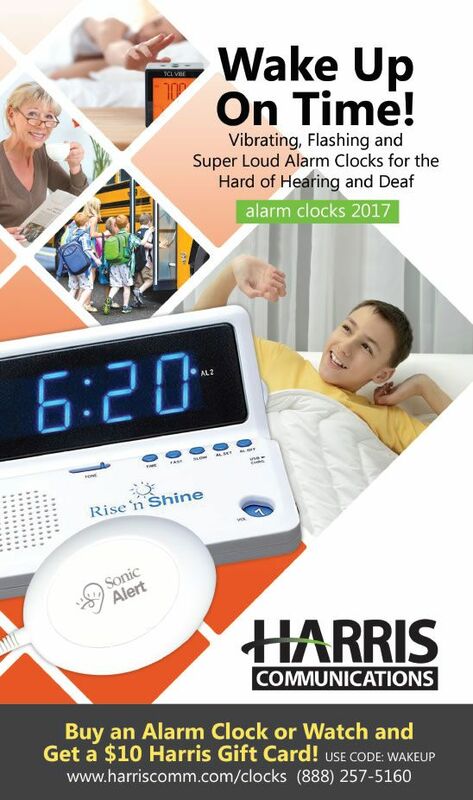 EDEN PRAIRIE, Minn. - July 19, 2017 - PRLog -- – Just in time for back to school, Harris Communications introduces a new brochure highlighting its latest alarm clocks and watches for the Deaf, hard of hearing and deep sleepers who cannot hear ordinary alarm clocks. "Most of us take it for granted that our alarm clock will wake us up," said Ray Harris, president of Harris Communications. "If you can't hear your alarm clock, it creates a lot of anxiety that can prevent you from getting a restful night's sleep, and that can affect your child's grades, your performance at work, as well as your health and safety. Our alarm clocks and watches will help you get out of bed on time so you can enjoy a stress-free morning, get the kids to the bus stop on time, and make it to work on time." Celebrating 35 years of helping the hard of hearing and Deaf live life to its fullest, Harris Communications provides more than 2,000 solutions for all levels of hearing loss. Based in Eden Prairie, Minnesota, Harris Communications, Inc. is a leading supplier of hearing loss solutions for people with all levels of hearing loss. Since its founding in 1982 by Dr. Robert Harris, himself a member of the Deaf community, Harris Communications has helped millions of Deaf and hard of hearing customers enjoy their lives to the fullest by providing expert advice and a wide range of more than 2,000 assistive devices and educational resources. The company's product line includes alerting devices, phone and TV amplifiers, personal amplification systems, tinnitus maskers, books and media and much more. Harris Communications also supplies ADA compliance products and hearing protection equipment.